Photo courtesy of David Faulker, SPX Sports. 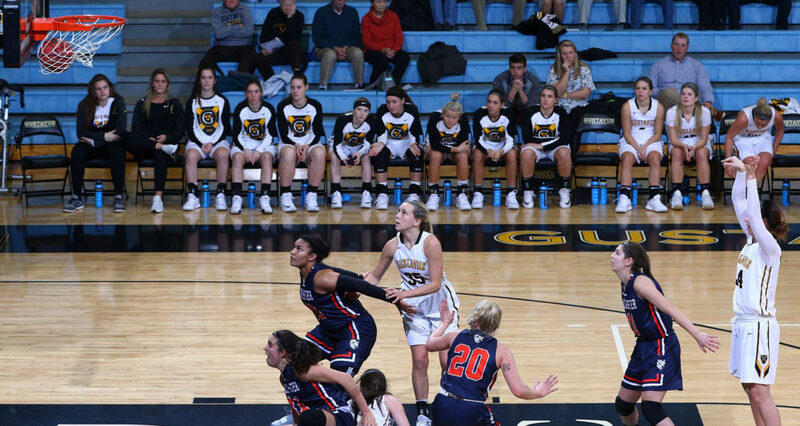 SAINT PETER, Minn. – The Gustavus women’s basketball team took on Macalester on Wednesday night and came away with a 70-56 victory. With the win the Gusties improve to 4-4 overall and 1-1 in the conference. After struggling of late from behind the arc shooting 2-34 in their past two games, the Gusties finally started to see some shots go down from three point range going 5-15 in tonight’s contest. The Gusties saw three starters reach double figures with Justine Lee (Sr., Dawson, Minn.) leading the way with 16 points to go along with four steals. Kendall Thompson (Sr., Eden Prairie, Minn.) and Paige Richert (So., Comfrey, Minn.) also filled up the stat sheet with Thompson tallying 13 points, eight rebounds, six assists, and five steals, while Richert notched another double-double with 11 points and 11 rebounds. As a team the Gusties out-rebounded the Scots 29-25 but won the offensive rebound battle 14-5 which helped them win second chance points over Macalester 12-6. “Today was just a really great win and gets us back on track for Saturday’s game,” Kelly said. The Gusties will next take on Saint Mary’s on Saturday for a 1 p.m. contest in Saint Peter, Minn.